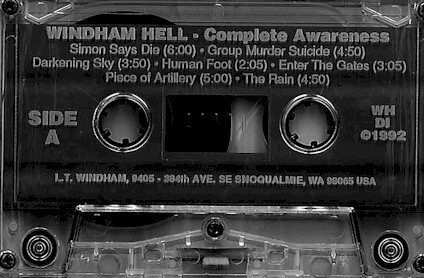 WINDHAM HELL originally was a project of one man from Snoqualmie, Washington, Leland Windham. He recorded his debut demo "Do Not Fear, For Hell Is Here" in 1988 on a 4-track. The demo was badly produced and was not widely spread. In 1992, he released his second demo "Complete Awareness," which was well received by the underground, and gained the band a cult following. In 1993, Eric Friesen (guitar, bass, drums) joined Leland Windham (guitar, bass, vocals) and they signed a multi-album contract with Moribund Records. In 1994, they released their debut album "South Facing Epitaph" in December.